The Mayor of Newark, N.J. has saved another dog — after getting a Tweet from someone reporting that the dog was locked in a small crate. Cory Booker responded to the tweet on Thursday and traveled to the scene to investigate. 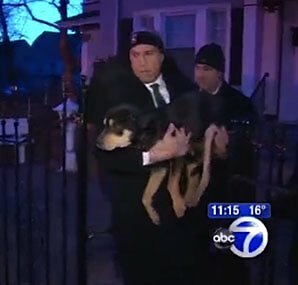 In January, the mayor rescued a freezing dog from the cold. And the year before, he saved a neighbor from a burning building. Before that, he shoveled the driveway for a senior citizen after a big snow.